Wreckers Museum and Oldest House Key West has is located at 322 Duval St. This Key West museum once belonged to a wealthy wrecker named Francis Watlington. As a wrecker and sea captain, he routinely searched the seas for ships that had foundered. His dangerous job meant rescuing crew, passengers and cargo, and for his efforts, he was handsomely compensated. Today, visitors can capture a glimpse of what life was like back in the heyday of the Key West wreckers. You'll find that this Key West museum is appropriately decorated with relevant furnishings of the Watlington family and ornate pieces. 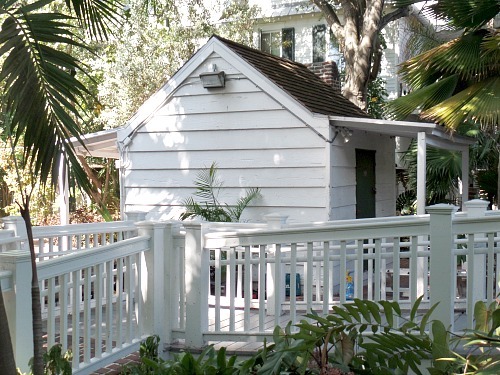 Built in 1829, the house has the distinction of not only being the oldest home in south Florida, but of one that has survived a variety of disasters. Over the cycle of the oldest house in Key West, it has endured occupation by Union forces, fire, Florida hurricanes, economic grumblings, pirates, the hot, humid, buggy tropical weather of the Florida Keys, and relocation. The relocation is a rare suffering for most homes. Sometime around 1836, it endured the arduous process of being placed on rollers, and slowly pulled by mules to it's current location on Duval Street in Key West. Originally built on a plot of land near Whitehead and Caroline, the owner decided to have the home relocated to the more bustling location of Duval Street. Built by a marine carpenter, the composition of the home is somewhat unique. First, Cussans incorporated ship building techniques such as mortise and tenon joints into the building process. This was doneto significantly strengthen it's overall structure. He also introduced a nautical theme into the 1.5 story design. The unusual features he included were portholes and a ship's hatch in the master bedroom ceiling. These elements served as an efficient means of allowing air to properly flow, and help cool the house during the heat of Key West summers. The architecture of the oldest house Key West has is one that's commonly seen throughout the southern United States where weather is often hot and sweltering. The style is typically referred to as New England Bahama and it includes a center hallway, with the various rooms branching off from the main corridor. This central passageway further helped with air circulation as it brought the breezes through the length of the house. It also allowed the owners to open or close certain rooms to have greater control over the internal temperature of the house. The oldest house Key West has, also utilizes another feature widely seen throughout the south. The detached kitchen, by it's design and separation from the rest of the home, served several purposes. First it was an effective precautionary method against kitchen fires. Second, it's separation helped to keep the main building from overheating when the beehive oven and stove were in use. Unusual in terms of the home's architecture are it's 3 dormer windows which add a sense of whimsy to it's facade. Usually dormers are of the same size, but on the oldest house museum their proportions are substantially different in both height and width. Another feature typical of homes from this era are it's gracious gardens. Captain Watlington was a man of considerable prominence and importance. His home and gardens needed to reflect his lifestyle and accomplishments. The beckoning grounds of this Key West home offer a beautiful retreat, and today serve as a popular destination for weddings and other social events. Docents are also on the premises. They'll happily regale you with anecdotes of the people who lived in this home, and in the town that was 'old Key West'. 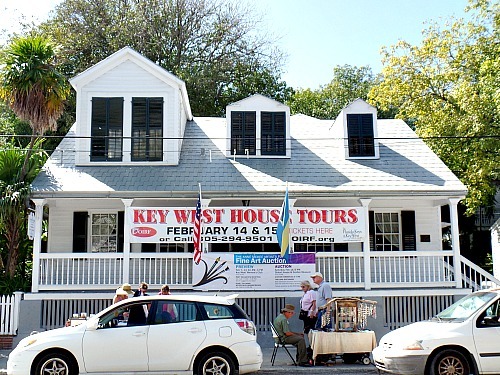 A visit to the Oldest House Key West has will provide an interesting look into the past. It also provides insight into the hazardous, yet profitable lifestyle of a wrecker. In honor of the brave men who lived the dangers of a wrecker, 2 rooms are set aside with memorabilia. You'll find salvage recovered from shipwrecks, along with ship models, charts, and other nautical artifacts which round out the wrecker theme of this small Key West museum. 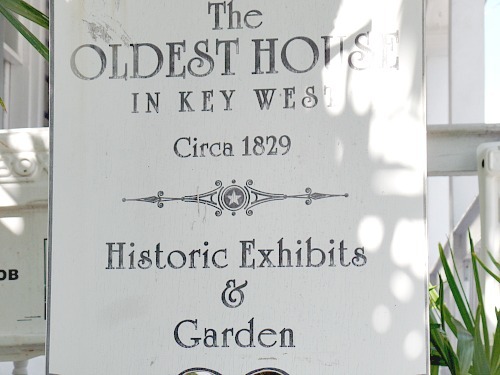 The Oldest House is one of the Key West museums that's free to visit. You'll want to plan on spending about an hour touring the home and grounds. It's open daily from 10:00 am to 4:00 pm, closed on Wednesday and Sunday. For questions on additional information you can call them at 305-294-9501.